Bear Mountain Orchards started in 1937 when Robert and Mary Lott purchased the home farm in aspers, Pennsylvania of 159 acres with a few established fruit trees. After few years of planting, maintenance, and increased production, the very first packing shed was built. Since then, the fruit acreage has grown significantly and the packing facilities have gone through many upgrades keeping up with the latest technological advances. The latest controlled atmosphere (CA) storage facilities were finished in 2014 in a partnership with Bream Orchards. Today, Bear Mountain Orchards is being led by the second generation siblings, John Lott and Sheila Gantz. Bear Mountain Orchards is still continuing its progression and innovation in the fruit industry. To read a great article written about Bear Mountain Orchards history, follow this link to Growing Magazine. January 3, 1937 – Robert and Mary Lott purchase the original 40 acres. It was a typical subsistence farm with pigs, chickens, cows and fruit trees. 1946 – The first packing shed is built and a variety of commodities are packed, such as green tomatoes, peaches and apples. 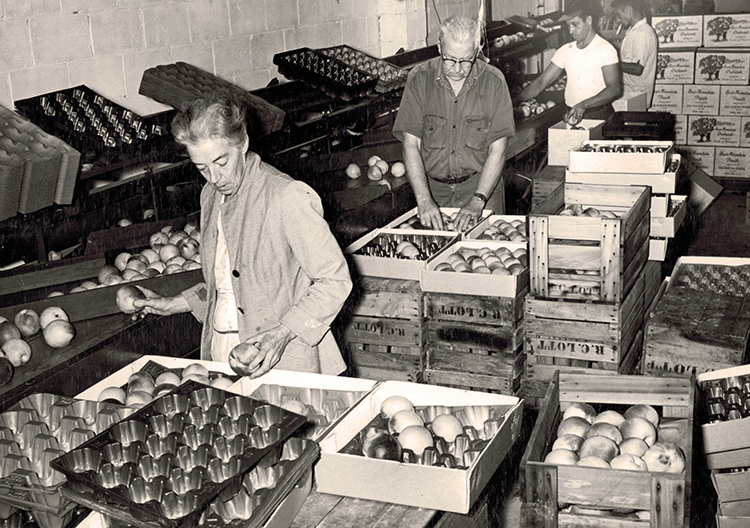 1946 – 1980 – As the economy grows during the postwar years, the production of tree fruits becomes more specialized, the value of the fruit increases, and the business focus shifts to growing only fruit. There are incremental increases in acreage and infrastructure as the business continues to develop; acreage grew to about 300 acres. John Lott returns to the business in 1972 with a degree in horticulture from Penn State University. Sheila Gantz returns in 1980 with a degree in ornamental horticulture from the University of Maryland. Mid – 1980s – Bear Mountain grows from 300 to 600 acres. The business is transitioned to the second generation in 1985 when Robert Lott dies. John and Sheila manage and continue to grow the business. The packinghouse is rebuilt, a new packing line is purchased, two cold storage facilities are built and more acreage is acquired. Orchards are transitioned to high-density fresh fruit varieties such as Gala, Fuji, Honeycrisp and Pink Lady. 2010 – Bear Mountain Orchards partners with Bream Orchards in Orrtanna, Pa. Together, they build a 300,000-bushel cold storage facility called Bream and Bear that is up and operational for the 2011 harvest. 2012 – Present – The new year brings a new Compac packing line to the Bear Mountain packing facility, a new marketing plan, and a newly acquired 80-acre farm. With over 75 years of growing experience, today Bear Mountain has over 1,000 acres of tree fruit in production and continues to embrace innovations to strengthen the business.